The Hall's Access Statement is currently being updated. Please contact us if you would like a copy in the meantime. At Markenfield we welcome visitors with disabilities and try to ensure that they see as much of the Hall as possible. The following information is designed to help make up your own mind as to whether Markenfield Hall would make a suitable day out for yourself or your companion. The Hall has its own dedicated disabled car park during the 32 days of opening. It is clearly signed, and as close to the Gatehouse as it is possible to get. It is not solely for Blue Badge holders, but for anyone who would have trouble walking from the main car park in the Paddock. There is an alighting point in front of the Hall should you be carrying a wheelchair passenger. 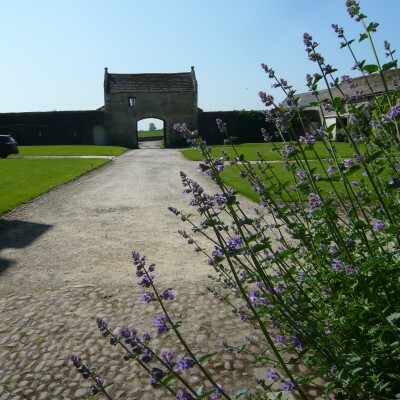 We would ask that you take care when driving through the Courtyard as there will be other Visitors walking about. If you are both the wheelchair user and the car driver, you are welcome to drive into the Courtyard and park at the front of the house. The Undercroft, Dogs’ Entrance and 1280 vaulted Utility Room are the only rooms open to the public on the ground floor. The remaining rooms are on the first floor and are accessible via a set of shallow stair. The treads are wide and there is a banister along one side. There are two landings on the staircase and chairs are often placed on these to allow for rest-stops if required. Because the Hall is a Grade I Listed Building it has not been possible to install either a lift or a stair lift. We have created a book of photographs of the first floor and the outside of the Hall with a wealth of information and this can be viewed in the Undercroft.